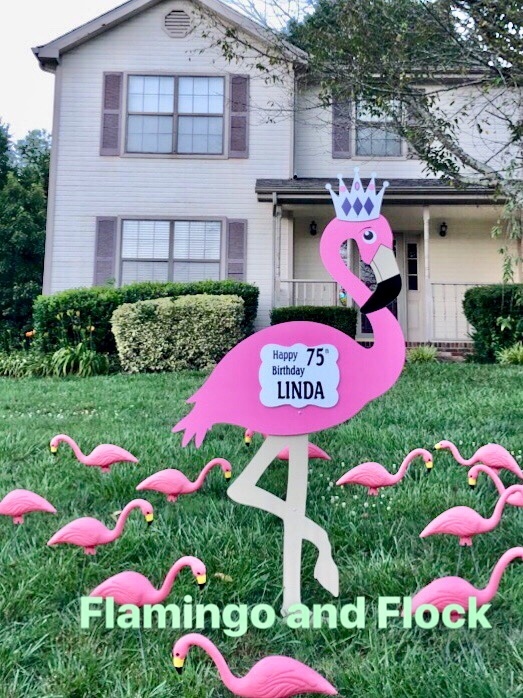 Our six-foot-tall PVC FLAMINGO is our most popular sign rental! Teens love him and guys prefer him for birthday celebrations. You choose the message he carries, and you choose the hat that he wears. The hat choices are a colorful sombrero, a black top hat, a cowboy or sheriff's hat, or a regal crown. The FLAMINGO can be rented alone (3 days for $65) or he can be rented surrounded by a flock for a small additional charge. Chattanooga Stork Lady is a home-based stork rental business located in the East Brainerd area of Chattanooga. We deliver to the greater Chattanooga area and parts of bordering North Georgia counties, including the following locations Chattanooga, Ooltewah, Collegedale, Signal Mountain, St. Elmo, East Brainerd, Soddy Daisy, Red Bank, Harrison, North Shore, Hixson, East Ridge, all of Hamilton County, Lookout Mountain – GA, Graysville – GA, Fort Oglethorpe, Rossville, GA, Ringgold, GA.